Altogether, there are a total of 486 directors, with the top 50 firms accounting for 338 and another 145 directors at 15 Fortune 500 firms in Orange County. Women directors in OC represent even lower percentages than their LA County counterparts. 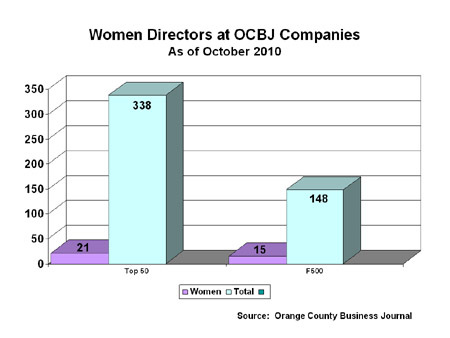 Women hold 6.2% of the director seats at smaller firms (21 out of 338 total directors) and 10.1% of the director seats at the top F500 firms (15 out of 148 total directors) in Orange County. This compares to 6.8% and 14.9% in Los Angeles County. 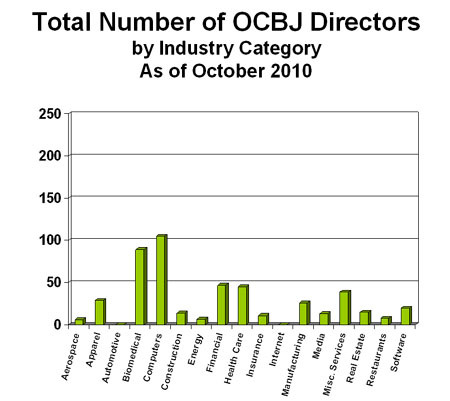 The total number of companies and the total number of directors by industry category mirror each other for Orange County. 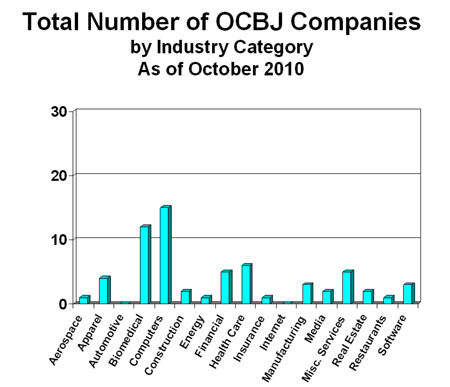 The companies (shown in the chart below) tend to concentrate in computers and biomedical industry sectors. The directors, shown in the chart left, below, show a similar pattern. There were 6 women each in the computer and the biomedical industry sectors in Orange County. Among the top 50 firms, only two firms had three women directors: Kaiser Aluminum and Resources Connection. Among the F500 firms, no firm had more than 2 women. As we would expect. the Orange County market is significantly smaller than the LA County market. Combined market capitalization of Orange County's top 50 firms is less than 20% that of Los Angeles' top 200 firms. OC's market cap for their 15 F500 firms is about 26% of LA's 23 F1000 firms. 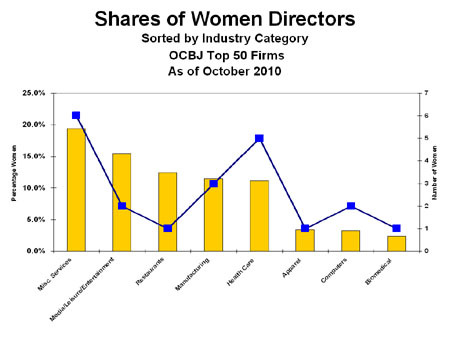 The chart, left, shows the shares of women directors by industry sector (yellow bar, left axis) and the actual number of women (blue line, right axis) for the top 50 firms as of October 2010. Misc. services is the dominant sector for women directors -- although there were just 6 women directors. The size of the board matters: 2 women constitute a 15% share of the media sector. Four women in manufacturing and 5 women in health care consitute just over 11% in each sector. 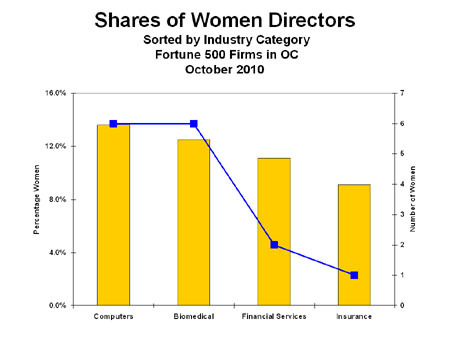 The chart, below, shows the shares of women directors by industry sector for the top 15 F500 firms in Orange County. Just 15 women served in four key industry sectors. Orange County market is concentrated in high technology -- both computer-based and biomedical. The average board size for the largest firms is 9.9 compared to 10.5 for Los Angeles F1000 firms, but the smaller firms in Orange County have 7 directors each compared to 6.7 for smaller firms in LA. There are 35 individual women on Orange County boards, and 1 woman serves on two boards: Virginia Ueberroth. I recognized 8 names from previous statewide F1000 women on boards research (about 23%). Los Angeles and Orange County together present us with 146 names of outstanding women directors who serve as leaders in our business community.